When you wander down Sunset Boulevard in Disney’s Hollywood Studios, you could be forgiven for being distracted. After all, your attention is almost immediately drawn to the screams being emitted from the large hotel at the end of the street. With all the chaos and attention that the Hollywood Tower Hotel is bringing upon itself, have you ever paused and looked at artifacts on the street just below your line of sight? On the left hand side of the street, as you make your way down to the Tower of Terror, there is a sign on the curb near Sweet Spells. The sign is a California marker for US-66, otherwise known as Route 66. The more interesting artifact, however, is the sets of luggage found at the base of the signpost. 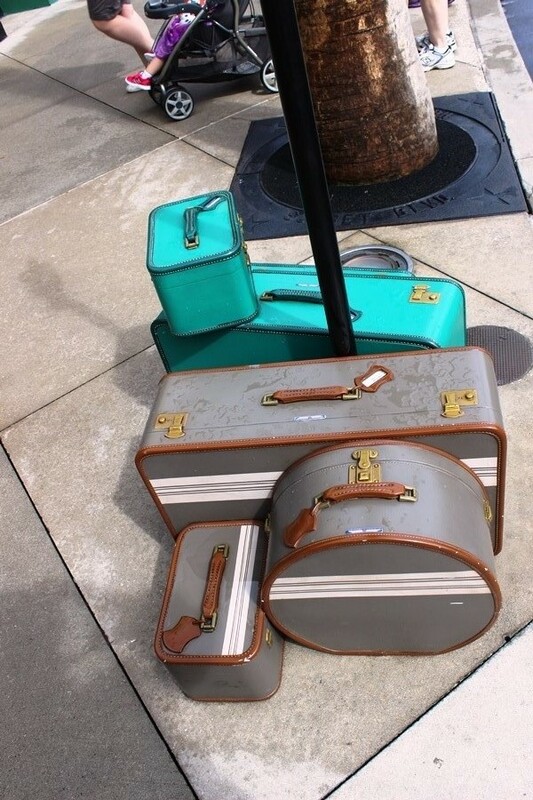 The two pieces of green luggage belong to Gilbert London, while the matching three piece set of brown luggage is the property of Carolyn Crosson. Both Gilbert and Carolyn, though perhaps she is better recognized by her stage name of Claire Poulet, both come to Sunset Boulevard as characters from the Tower of Terror episode of The Wonderful World of Disney. The episode aired on October 26, 1997 and featured Steve Guttenberg and Kristen Dunst as a reporter, Buzzy, and his niece, Anna. Gilbert and Carolyn are two of the five ghosts featured in the attraction and the film, though they are portrayed by a different acting pair in the television installment. Gilbert is the snarky and snide actor who, deep down, has compassion for his fellow ghosts. Carolyn is a warm and caring individual, who tries to be as open and honest as one can be in her situation. While not what one would expect, they were in love prior to their deaths in the Hollywood Tower Hotel’s elevator in 1939 and remain so in the afterlife. The episode would go on to be released as a standalone film, but there are never references made to the attraction or story’s tie to The Twilight Zone. The Tower of Terror feature can be seen as the beginning of Disney’s attempt to bring attractions and their stories back to film, as this predates Pirates of the Caribbean, The Haunted Mansion, The Country Bears, and the like. In fact, all exterior shots of the hotel and several of the interior scenes were filmed at the Hollywood Tower Hotel at Disney’s Hollywood Studios, then Disney-MGM Studios. Gilbert and Carolyn finally get their storybook, or science fiction television, romance at the end of Tower of Terror. However, their theme park counterparts are still sending chills up the spines of guests daily. I much prefer the first ending to their story, don’t you? Regardless, these sets of American Tourister luggage have been awaiting the return of their owners for a very, very long time.